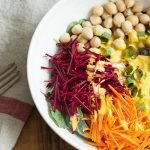 I love it when a nutrition client presents me with a culinary challenge — a request for a vegan version of a favorite recipe, a meal idea, a special sort of snack or treat. 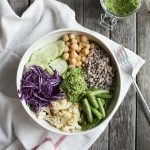 The latest such challenge/request came from a client who’s just getting into the idea of a salad for lunch–something she can order at a deli near her workplace–but who’s having a hard time enjoying salads at home. I suspected, and she agreed, that problem here may really have nothing to do with salad, and everything to do with dressing. A good dressing can make or break a salad, a grain bowl, or a slaw. Ho hum dressings mean bland salads, whereas a really bold, flavorful dressing can easily transform the most humble bowl of veggies into something very meal-worthy. My client told me that she tends to get honey mustard dressings on her salad. My goal was to give her something that would be a little more wholesome than most commercial honey mustard dressings, yet still really salty and sweet. And I wanted to make it vegan, so that I could try it and enjoy it along with her! I had two sources of inspiration for this dressing. The first was the “Dijon-Cider Dressing” from Natalia Rose’s The Raw Food Detox Diet, which is the book that taught me most of what I know about salad-making. 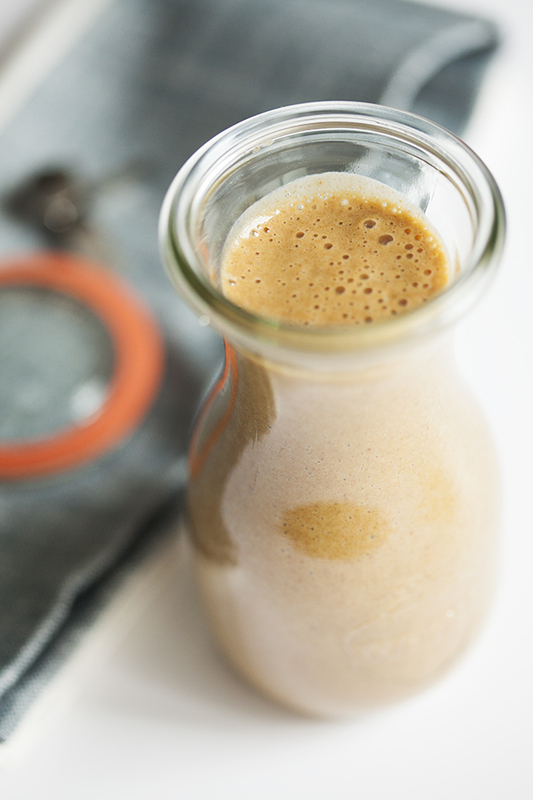 It’s a spin on honey mustard, but it uses apple cider vinegar and stevia. I don’t use stevia, so the sweetness in this recipe comes from pitted medjool dates. The other is the “Liquid Gold” dressing from Vesanto Melina and Brenda Davis’ classic book, Becoming Vegan (one of the all-time greatest plant-based nutrition primers out there). 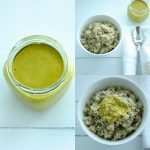 That recipe was the one that inspired me to start using nutritional yeast in dressings, which is something I’ve loved doing ever since. 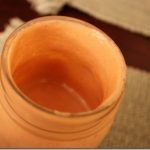 I never need an excuse to use nooch, but I particularly love the savory, umami-rich quality it lends to dressings, along with the protein and B Vitamins. 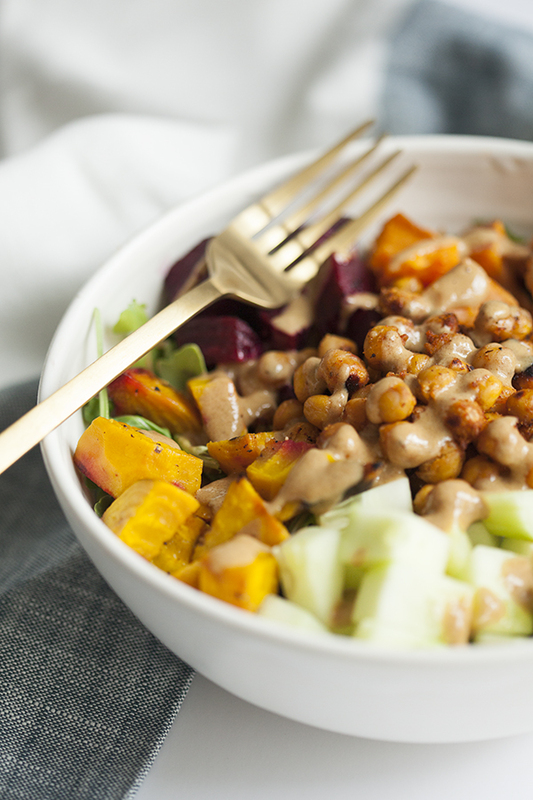 This dressing is very sweet and very salty. I love that particular combination, so it’s right up my alley, though I do want to mention that you can adjust the sweetness by adding one less date, and you can adjust the saltiness by adding one less tablespoon of tamari. It’s also very tart, thanks to a balsamic and apple cider vinegar mixture (the former adds a syrupy and rich flavor to contrast the bright tartness of the ACV, but you could do all apple cider vinegar if you prefer). The great thing about this dressing is that its bold flavor ensures that a small amount lends tremendous character to your dish. It’s as good for dipping vegetables for a summery snack as it is for dressing salads and grain bowls. 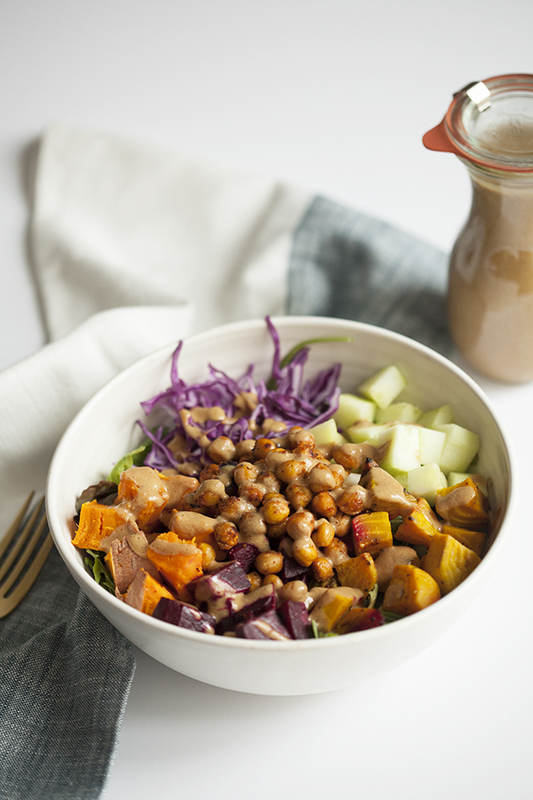 Speaking of salads, I used this new dressing recipe as an excuse to make a new, summery salad. It’s a mixture of hot and cold and a celebration of color. I didn’t plan on sharing the salad itself in this post, but after I scarfed it up yesterday I determined that it was too good not to share! To assemble the salad bowls, divide all ingredients evenly among four bowls of plates. Use the greens as the base and then arrange the other ingredients on top. Drizzle with the sweet Dijon vinaigrette, and serve. 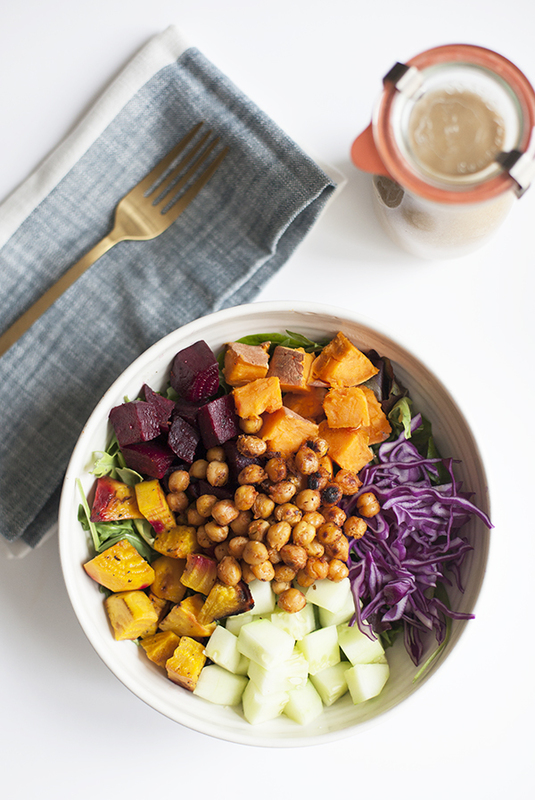 The combination of salty, toasted chickpeas, sweet beets, and cooling greens compliments the zesty, sweet/tart/salty dressing really well here. I have a feeling that this one is about to be one of my new favorite summer go-tos. I’ve had bowls on the brain lately, because I just finished testing a different vegan bowl for my next Food52 column. I can’t wait to share that one with you all, too. Of course, you certainly don’t have to serve the dressing with my salad bowl idea. If you make it, let me know how you choose to serve it. I hope you’ll enjoy the recipe as much as I have! On Friday, I’ll be back with a new, easy vegan dinner option. In the meantime, thanks for your thoughts on my last post. I hope that your weeks are going smoothly. 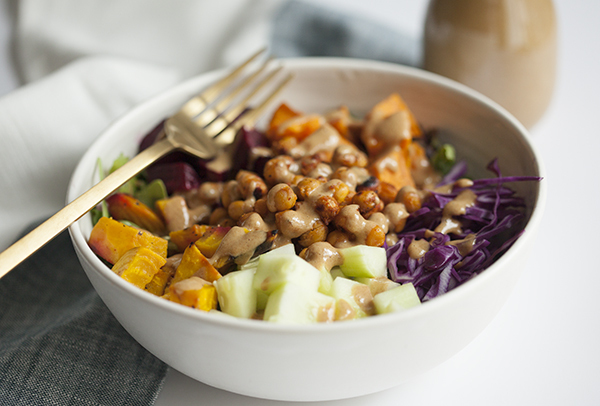 That dressing sounds fantastic — as does everything else in that bowl! 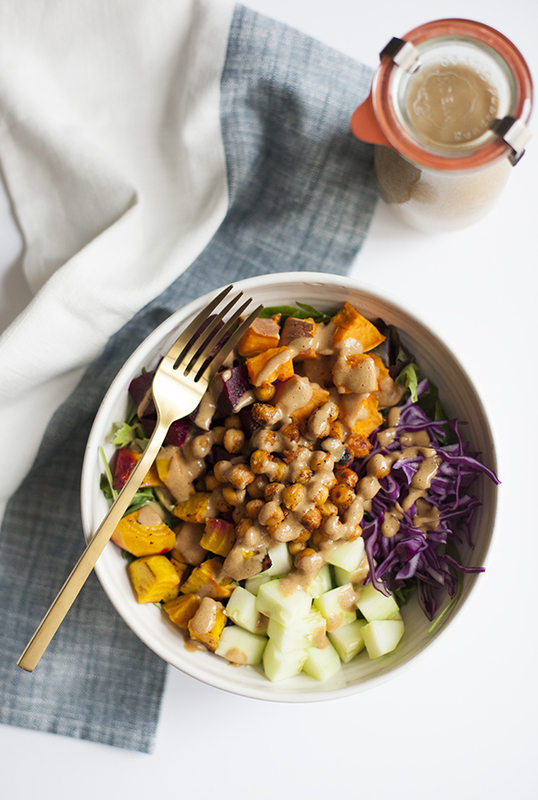 Homemade salad dressings are truly the best. Yes! Perfect timing for me. I’ve been making some awesome salads at home but homemade dressings, not so much. Finding great dressing recipes has been my goal for the last week or so and I’ll definitely be adding this one to my list to try. Thank you! What a way to bring any salad to life! Love the fact that you’re able to combine sweetness and saltiness and still keeping it vegan friendly, I think even the kids would dig this! This looks amazing, and it is soy-free — I found out last week than I’m allergic to soy. I’ll definitely try this dish tonight. Thanks for sharing this recipe! Wow…too much sodium for my preferences. I am hoping that your traditional R.D. program will undo some of your misguided raw food teachings on the nutrional basics, such as sodium content and saturated fat content, so that I don’t have to modify your recipe postings so often. Also, I am happy to see your recent movement in the direction of more spicy, less bland recipes. For example, your roasted red pepper romesco sauce w/ses. seeds is on regular rotation in this house (though I roasted my own peppers to avoid the excessive sodium in the jarred versions I found.) Please continue on this track with your more balanced/cooked cuisine choices. I used this as inspiration last night! I made some modifications based on what I had on hand (maple syrup for the dates, pumpkin seeds for the flax and hemp) and it came out awesome. Thanks for the idea! I love a good salad during summer! Thank you for an oil free option! It’s creamy and delicious! It’s really difficult to find oil /nut free dressings that are satisfying. You nailed it with this! Your IG lunches are always my lunch inspiration! Totally just roasted a bunch of beets and sweet pot’s, made a batch of this dressing, and cooking dried chickpeas as we speak 🙂 Thanks, Gena! What a beautiful salad–and a delicious dressing! I can’t wait to make this. If I wasn’t headed out of town, it would be my lunch tomorrow, haha.